Founded in 2003, Blackbird Vineyards is an artisanal producer of Right Bank Bordeaux-inspired wines. In conjunction with the Blackbird estate vineyard - which provides fruit for the foundation of the wine portfolio - Blackbird Vineyards fosters long-term partnerships with premium vineyard sources throughout Napa Valley, where growers are passionate about their approach to farming. These vineyards are hand-selected for their health, superiority and exceptional fruit quality, allowing Winemaker Aaron Pott to produce elegantly styled, appropriately balanced red wines that offer short and long term cellaring potential. Blackbird Vineyards wines are available direct from the winery and in the finer restaurants and hotels around the country. Our tasting room RiverHouse by Bespoke Collection is located in downtown Napa, on the historic riverfront. Join us for a portfolio tasting while being surrounded by a curated selection of fine art, antiquities, and objets d’art by ÆRENA Galleries & Gardens. 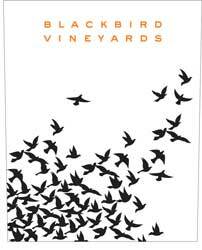 Please inquire for wine tasting opportunities with Blackbird Vineyards. To join the wine club, visit www.blackbirdvineyards.com or call 707-252-4440. Blackbird Vineyards' BlackMail Membership offers first access to a selection of wines from the acclaimed Blackbird portfolio of wines crafted by winemaker Aaron Pott. Select your preferred wines and choose your shipment program to create your own bespoke wine experience. Blackbird Vineyards is certified under the Napa Green Winery Program by the Napa County Department of Environmental Management (DEM) and the Association of Bay Area Government’s (ABAG) Green Business Program and completed all the regulatory components needed for environmental sustainability. These components included developing water and energy conservation methods, preventing pollution, and reducing solid waste. In addition to developing sustainable winery practices, this program is set to become the standard for the state of California. Blackbird Vineyards is certified under the Napa Green Certified Land Program. Blackbird Vineyards has created and implemented a customized farm plan with measured results that addressed all aspects of its property, vineyard land as well as non-farmed land, including practicing soil conservation, water conservation, stable drainage, riparian corridor enhancement, fisheries and wildlife habitat enhancement and long-term improvement and sustainability.